For the cynical Muggles (aka non-wizarding folk) out there, the June 18, 2010 opening of The Wizarding World of Harry Potter sounds like the most elaborate merchandising scheme on the planet. 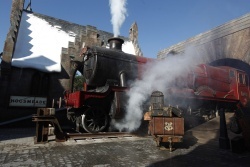 But once you step through the gates that separate the fictitious village of Hogsmeade from the rest of the Islands of Adventure theme park at Universal Orlando Resort, the experience is, well, downright magical. More than a themed attraction, it's totally immersive, like stepping onto a film set – in fact, with the Harry Potter film team involved, there's been design crossover between the as-yet-unreleased movies in the series and set pieces in the park. The stores include Ollivanders, with 16,000 wand boxes rising to the ceiling; the Owl Post, where souvenir postcards go into the world with a Hogsmeade mark; and the sweet shop Honeydukes, selling chocolate frogs and Bertie Bott's Every Flavour Beans (ewww, garlic!). In the Three Broomsticks, guests can dine on family-style feasts that mimic the dinners served in the great hall of Hogwarts. And yes, they sell butterbeer, Harry's non-alcoholic beverage of choice, which is sweet like cream soda with hints of butterscotch and has a thick, foamy head that lingers past the last delicious drop. Even the restrooms have a touch of fantasy, with the voice of ghostly Moaning Myrtle echoing off the walls. Two repurposed roller coasters are secondary to soaking up the scenes: Dueling Dragons is now the Dragon Challenge, keeping the same intertwined track that looks as if its two rollers coasters will collide, but adding themes from the Goblet of Fire's Triwizard Tournament to entertain those standing in the sure-to-be-lengthy lines. Flight of the Hippogriff is a small family-style coaster designed around Hagrid the groundskeeper's cottage, worthwhile for all ages for the majestic view of Hogwarts and the snow-capped buildings of Hogsmeade from its zenith (especially at night). The piece de resistance: Hogwarts castle itself, soaring more than 150 feet from its "rocky" outcrop (and successfully designed to seem even taller). Hogwarts houses Harry Potter and the Forbidden Journey, an interactive ride debuting new robotic theme park technology to send passengers along on Harry's cinematic adventures. Getting to its entrance is more than half the fun – the line snakes through the Defense Against the Dark Arts Classroom, Dumbledore's office, and soaring hallways where the portraits move and speak to one another. It's designed to take an hour and still contains more detail than you can comprehend in one saucer-eyed trip. Repeat visits are all but guaranteed for Potterphiles. For more trip-planning information, see our Orlando Travel Guide, then search for Orlando deals with our Travel Search price comparison tool.